Anything dealing with a treatment of Scripture. Ladies and Gentlemen, more Revelation notes! *The crowd goes nuts* Please, please, contain your excitement. Okay, seriously. 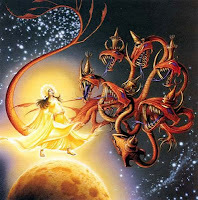 Last night I talked about the vision of the woman with child, the red dragon, and the two beasts. There’s lots of historical context that helps make sense of this passage, and is pretty fascinating to boot. What it boils down to is an allegory of the church being protected, an assurance that Satan’s time is short, and an expose of the political, economic, and religious forces that Satan has used, and continues to use for his ends. You can find the notes here. Also, I used a list of verses last night concerning Eternal Life Now. I had some requests for that list, so it is here. I would highly recommend anyone reading to print out that document and prayerfully consider the verses included. You might also consider taping it up somewhere (like your bathroom mirror) and meditating on one of the verses a day. It could change your life. Last night I went over the central part of Revelation, the parable of the two witnesses. Yes, I said parable. I know that many people understand that passage to be literal, but considering how many elements of the passage are clearly figurative (especially the “mystical city”) it is much more illuminating and powerful (and internally consistent) when we understand it as a parable. It is particularly a parable about the church’s role as a witness to the people of the world, and of the life of Christ lived out through us which is God’s plan for the redemption of the world. Not sure? Check out my notes here and then leave a comment. Well, I promised my weekly notes on Revelation so… you can get them here. 1. That God’s response to the saint’s cry of “How long” is one of judgement (just as it was for the Israelites in Egypt). I intend to explore the subject of God’s judgement more in depth at a later time. 2. That God first judges the idols (both in Exodus and in Revelation) to show that they are powerless. 3. That there are demonic influences behind idols, and ironically, the things that we worship end up causing us torment and even death. 4. God intends for judgement to lead to repentance. There are so many other things to cover but these are some of the main points. You can see it all laid out in my notes!